Don't get me started on Daddy! The “Dark Universe” has begun with a big dud. The Mummy, the first building block in Universal’s new cinematic world inhabited by the studio’s classic movie monsters, is a mess. Wandering aimlessly between tame horror, cutesy comedy, and world-building with little context, the film is a murky, shapeless mass of marketing materials. There are big CGI moments made for the trailer, lame zingers, and, of course, the promise (threat?) of similar spinoffs. What’s missing is any sense of identity or purpose. 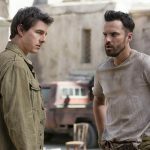 This updated take stars Tom Cruise as Nick Morton, an Army scout who’s more interested in treasure hunting than military missions. 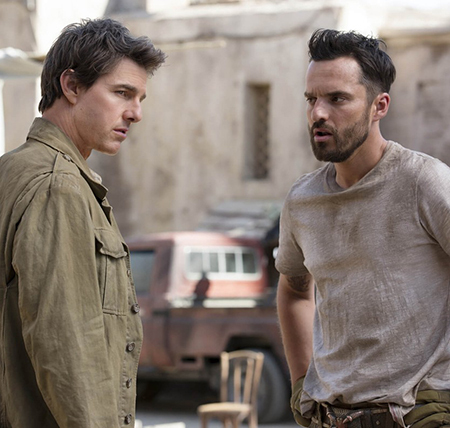 In search of valuable antiquities, Morton and his wisecracking sidekick (Jake Johnson) foolishly ride into a dangerous Iraqi village – because violent insurgents and drone strikes fit nicely into a modern swashbuckler – and uncover an ancient Egyptian crypt. Expert Jenny Halsey (Annabelle Wallis) appears out of nowhere to provide information and set up jokes about a tryst she had with the scheming Morton. 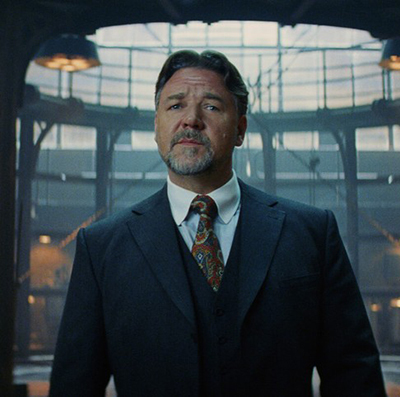 The question regarding an Egyptian tomb being located in Iraq is raised and never really dealt with, which is a recurring problem with the film. The adventurers remove a sarcophagus from the tomb, awakening the malevolent, mummified Princess Ahmanet (Sofia Boutella), who has a motiveless plan to unleash evil. The deviousness involves making a connection with Morton. Sloppy storytelling begins in earnest with prologues that jump from crusading English knights, to Ahmanet’s Ancient Egypt and modern-day England before finally getting to Nick in Iraq. From the start, The Mummy shows little interest in structuring a cohesive narrative. The story is unnecessarily complicated while also lacking any depth or direction. The eerie romance that existed in the 1932 Boris Karloff version and the breezy adventure of the Stephen Sommers-directed 1999 reimagining are hinted at, but merely as components of the hodgepodge. The lore is repeated ad nauseum, making us care less with each dull non-development. Russell Crowe shows up as Dr. Jekyll (not a Universal monster but whatever), who in this world is the head of a shadowy organization that deals in the super-serious realm of “gods and monsters.” Crowe’s somber monotone can’t disguise the fact that Jekyll talks in circles while not really saying anything. Jake Johnson works a little better as our other expositional guide, despite having access to important information for no discernible reason. With a character reminiscent of Griffin Dunne in An American Werewolf in London, he makes the nonsense entertaining with his amusing manner of speaking. Unlike Johnson, Cruise’s charisma is buried by overwrought plotting and an avalanche of forced one-liners. The film pokes fun at the actor’s dynamic screen presence with moments of levity that paint Morton as a seriously flawed antihero, but the lightheartedness is at odds with dangers that are played painfully straight. As his foil, Boutella brings impressive physicality to Ahmanet, whether its escaping from chains or tossing Cruise around. She’s sadly underutilized, however, with the film that bears her character’s name eager to show us vampire skulls and Creature from the Black Lagoon hands floating in glass jars. This Marvel-inspired Dark Universe is already overdesigned. It even has its own logo that appears after the familiar Universal globe. The undead Ahmanet is all contrived style as well. She has unexplained symbols all over her grey skin, ashen fingertips, two irises in each eye, and perfectly-placed wraps that stick to Boutella and cover just the right places. She’s a shiny monster with nothing to do but rage when called upon. Moments of potentially effective horror – her sucking the life of victims to become more powerful, are so dark (especially in the pointless 3-D) that it’s hard to tell what’s going on. Many of the action scenes are dimly lit compositions with Cruise and Wallis running from poorly rendered creatures. The one bright spot – literally and figuratively – is a Zero-G airplane crash sequence that includes a scramble for a parachute. 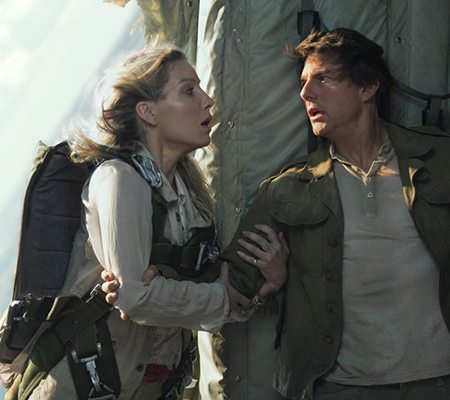 The thrilling moment staged by director Alex Kurtzman feels like it was lifted from one of Cruise’s Mission: Impossible films and is just one of the incongruent fragments in a design that feels by-committee. The many pieces that inspired this uninspiring Mummy just don’t fit together, making for a drab exercise that lacks focus. If there’s a takeaway for the fledgling Dark Universe – which looks like it may have counted its monsters before their plots were hatched, it’s the need to concentrate on the iconography and themes stirred by the individual creatures before worrying about what’s coming next. Pingback:Мумия (2017) | Кино Новости.